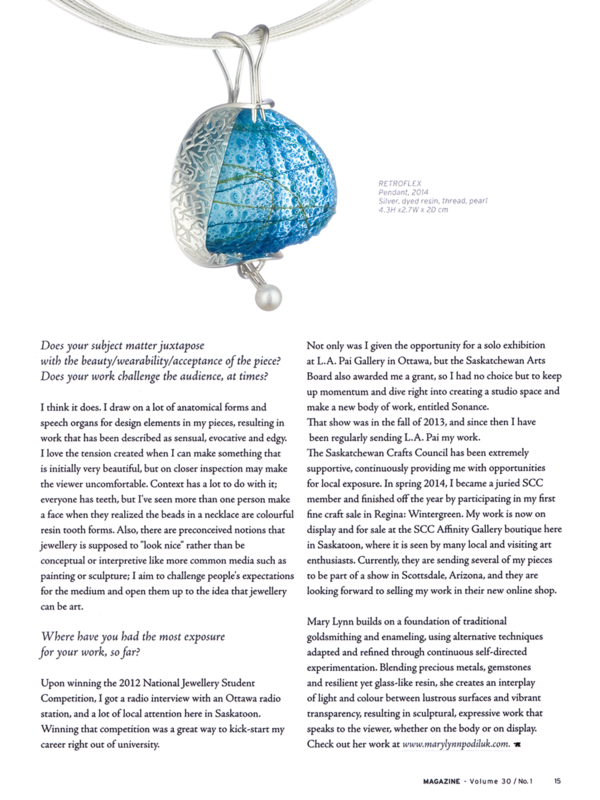 An interview with Mary Lynn Podiluk, Curator of "Contemporary Jewellery by Melody Armstrong" at the Saskatchewan Craft Council's Affinity Gallery on September 12, 2015. 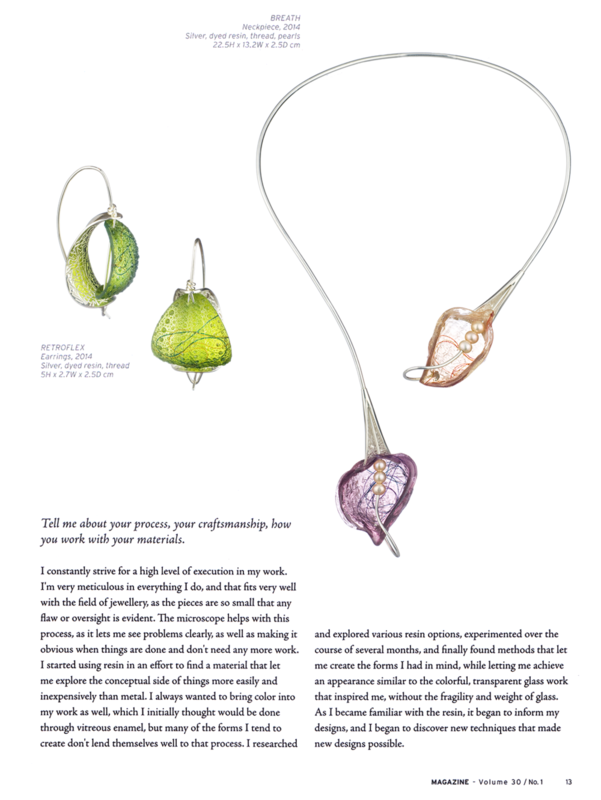 In this exhibition of wearable works, Melody Armstrong showcases elaborate and complex jewellery pieces which juxtapose organic reference with industrial aesthetic. Schimnowsky, Maureen. "Mary Lynn Podiluk, Artist and Innovator". Saskatchewan Craft Council Blog. 19 Aug 2015. Web. Podiluk, Mary Lynn. 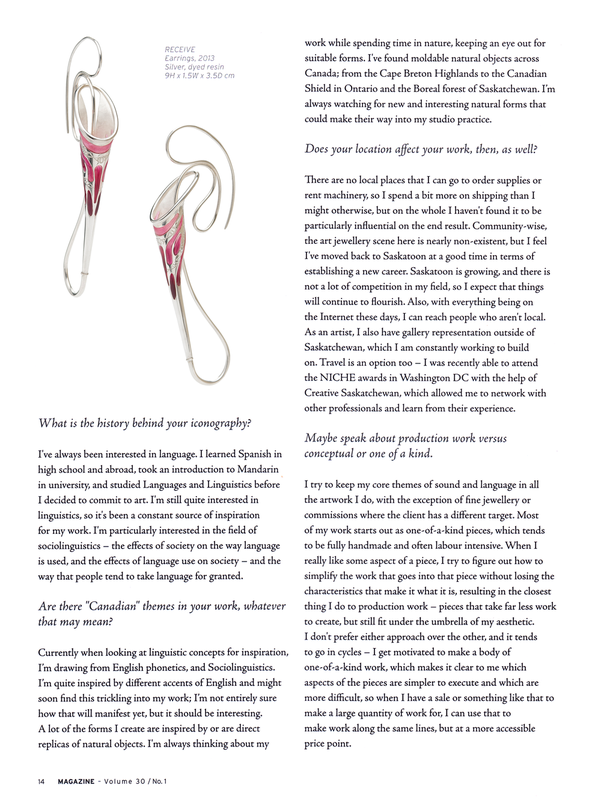 "Curatorial Statement: Contemporary Jewellery by Melody Armstrong" . 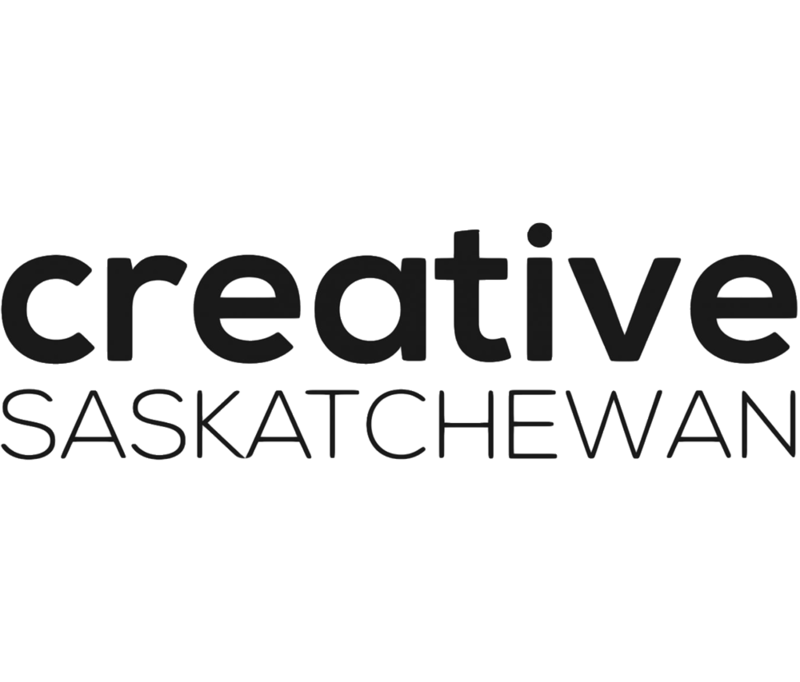 Saskatchewan Craft Council Blog. 01 Oct 2015. Web. Boklaschuck, Shannon. 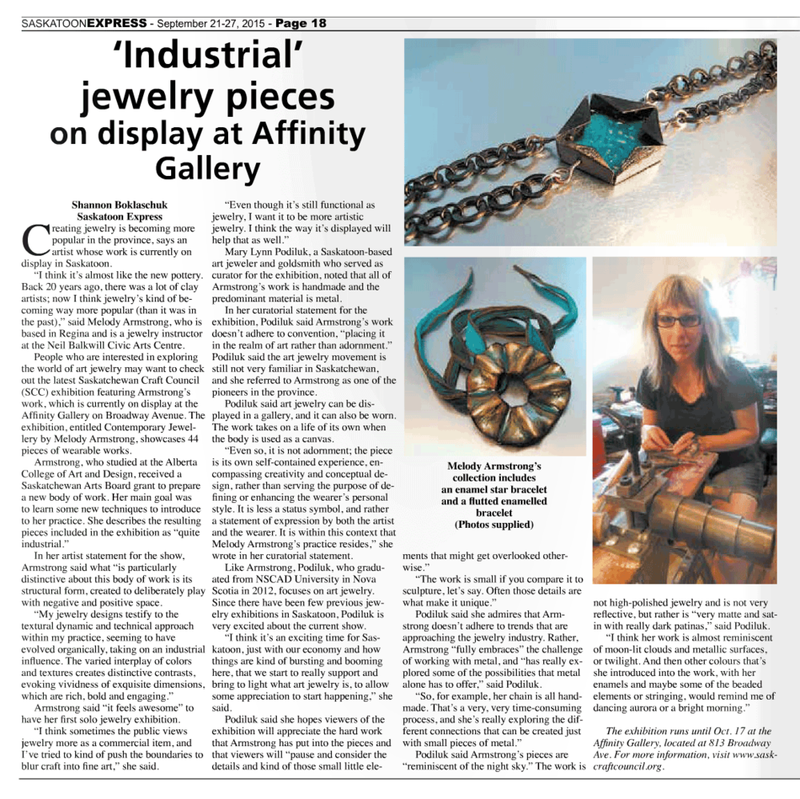 "'Industrial' jewelry on display at Affinity Gallery." Saskatoon Express [Saskatoon, SK] 20 Sept. 2015: 18. Print. Mary Lynn Podiluk. Interview by Tara Owen. "In the Studio". MAGazine: Volume 30, No. 1. 2015. 10-15. Print. Barnard, Elissa, "NSCAD University students craft vision with tradition". The Chronicle Herald [Halifax, NS] 3 May 2015. Print. "Niche Awards names 2015 design winners". National Jeweler, 17 Feb. 2015. Web. "Mary Lynn Podiluk, Saskatoon goldsmith, wins Niche Award". CBC News, [Saskatoon, SK], 22 Jan. 2015. Web. Jeff Rogstad interviews Mary Lynn Podiluk about her work and being named a 2015 NICHE Award finalist for her handcrafted engagement ring 'Infinite'. Aired on CTV Saskatoon Morning Live, Dec 11, 2014. Lisa Dutton interviews Mary Lynn Podiluk about the upcoming 2015 NICHE Awards and the piece that was named a finalist. Aired on Global Saskatoon Morning News, December 11, 2014. Full article here. "2015 NICHE Awards recognize Saskatoon goldsmith". Canadian Jeweller Magazine, Dec. 2014. Web. Morin, Chris. "Hand-made ring up for award." The StarPhoenix [Saskatoon, SK] 11 Jan. 2014: D1. Print. Podiluk, Mary Lynn and Megan C. Broner. “Postcards – One Community, Two Perspectives on Craft.” Studio Fall/Winter 2014-2015 Volume 9, No. 2. 64. Print. Front cover image of teapot 'Metalanguage', MAGazine: Volume 27, No. 2. 2012. Cover. Print. Mitchell Caplan interviews Mary Lynn Podiluk about the upcoming National Jewelery Student Competition. Aired on CHUO-FM89 Ottawa on July 25, 2012. Tomlinson, Joelle, and Ciara Richardson. "Saskatoon jewelry-maker wins national competition." Saskatoon Express [Saskatoon, SK] 20 Aug. 2012: 9. Print. Jill Matthews tours the NSCAD Jewellery Studio to get insight into what will be seen at the annual jewellery show and sale 'You Wish'. She interviews Mary Lynn Podiluk and MengNan Qu who coordinate the show. Aired on CTV Halifax Live at 5 on November 18, 2011. Smulders, Marilyn. "Annual jewelry show opens Wednesday". NSCAD News [Halifax, NS] 21 Nov. 2011. Web.